A series of berms, or temporary holding basins, on Doug Larson's farm south of Lake Koronis will keep over 600 tons of sediment and nutrients from washing into the lake and river each year. The $45,000 conservation project will reduce erosion into the watershed for less than four cents per pound. Right now, 881 tons of sediment and nutrients washes from a 162-acre drainage area into Lake Koronis, according to the project's organizers. The series of four berms will reduce that load by 75 percent to 260 tons per year, a reduction of 621 tons, or 1,242,000 pounds of sediment and nutrients. Think of this savings another way. A typical dump truck hauls about 11 yards of dirt weighing about 15 tons. This project will keep over 40 dump truckloads of dirt from reaching the lake each year. 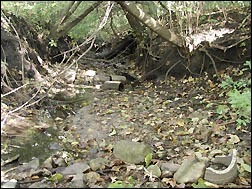 Erosion over the years has created a six-foot-deep, ten-foot-wide ravine in the woods on the farm owned by Doug and Steve Larson. The farmland on the 200-acre farm was tiled back in the 1950s or 1960s, before he and his brother purchased the farm in 1977, according to Doug. That tile line dumps into the woods. "It's been eroding little by little," explained Doug, who grows soybeans and corn on the farm. "In 1993, in the floods, it really eroded." Greg Berg, a shoreline specialist with Stearns County Soil and Water Conservation District, approached Larson about doing a project to slow the runoff and allow the nutrients and sediment to settle before the water flows into Lake Koronis. Larson had been interested in doing something but couldn't afford the project all on his own. Other participants in the project included the Koronis Lake Association, the North Fork of the Crow River Watershed District, the Crow River Organization Watch, and the Meeker County SWCD. Larson's land is in Meeker County, but the water flows into Stearns County and into Lake Koronis. A series of four berms will hold runoff water for up to 24 hours, slowing the water flow and allowing suspended solids and nutrients to settle before the water is released. Without the project, during a four-inch rainstorm, water would flow at a rate of 135 cubic feet per second. That flow will be reduced to two cubic feet per second with the series of berms, according to Joe Girardi, a engineer tech with the project's engineering consultant. The highest berm - 18-feet tall in the middle and 211-feet long - is in the woods. "That berm is deep enough and high enough to collect the dirt," said Larson, "so there'll only be clear water running in the lake." Another smaller berm is at the start of the woods to slow down the water as it flows into the ravine. Berg and Girardi hope that slowing down the water will help to heal the quarter-mile-long ravine. If vegetation grows along the banks, future erosion will be limited. The largest berm will be a three-foot high, 600-foot long one in the middle of the Larsons' field. This berm will hold up to 680,000 cubic feet of water for 24 hours during wet weather. "It benefits me," said Larson, who is also contributing financially to the project. "It's going to stop eroding my field." "The main thing is keeping dirt out of the lake," he explained. "I'm sure everybody downstream agrees: when it rains, it gets pretty black." "You're storing water and releasing it slower," added Girard, "rather than have it all rush through." The fourth berm is on the boundary of Larson's property and his neighbor, Tom Burr. This berm will enhance an existing wetland. The berms in the fields will have to wait to be constructed until Larson harvests his soybeans from the field. Water in the field will be piped from the berms to the end of the ravine by underground pipes. In all, the four berms will temporarily hold 1,170,000 cubic feet of water, which should have an impact on the water quality of the lake. "If you can do some projects like this," explained Berg, "it can make a big difference." 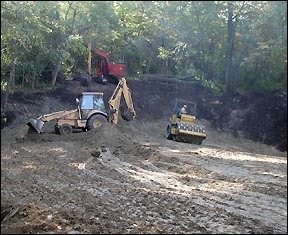 The berm in the woods will also create a permanent holding pond, with up to three feet of water. Larson's son, Adam, likes to hunt, and the pond should provide better wildlife habitat. It should also keep deer from crossing the road - and getting hit - while trying to get water from the lake. The entire system should be in place for a test next spring. Larson, an avid snowmobiler, hopes the area gets lots of snow this winter, which should provide a good test for the system next spring. This project exemplifies projects that will help improve water quality in the lakeshed, according to Berg. Stearns County SWCD recently received a $75,000 grant to continue to research and make improvements in lakesheds in the county. Of that grant, $25,000 will go to study the lakesheds of Rice Lake and Lake Koronis. The lakeshed includes all sources of water into the lake, including the river, springs and creeks into the lake, and surface runoff. It includes most of the watershed district, except it ends at the lake's outlet. The county has already studied the lakesheds of ten lakes in the county. Berg is also looking for interested community residents, not just lake homeowners, to take a healthy lakes class and to lead a group that looks at improving the lakeshed. Berg can be contacted at 320-251-7800, extension 3. The other $50,000 of the grant will go to do improvement projects in the lakeshed, like the Larson project south of Lake Koronis.